Announce on April, 18th 2004 on Sourceforge as "Another Xtree Gold 'clone'", offering a 0.1 source release for download. It is appearently pre-alpha stage: Although I was able to compile it, I haven't got further than to run it, showing me a rather empty screen with some awkward error message on top; however, the hotkey "q" to quit to program at least works... and while there absolutely *no* documentation whatsovever, currently this seems to be something like a zombie project. This is an extensive and very powerful utility with a great number of additional features. The screen layout, although a typical Windows one, leans much more upon the XTree for DOS versions than XTGW 4.0 did. Uses many of XTreeGold's hotkeys. Calypso runs stable, only seems to be a bit fuzzy in its reaction to keyboard inputs. Nevertheless a remarkable piece of software! Anyway, it's worth a try ! A remarkable attempt in creating a thorough text-mode XTreeGold clone for Win95-XP. Appearance and user interface formed as close as possible to its model, here strongly resembling to Kim Henkel's |ZTree versions. In contrast to the latter, CDCAT has been left behind as a date-limited Beta version in 1998, and seems to be no longer supported, with a number of the advanced functions not yet implemented (such as F8-Split screen, F7-AutoView, a help-system, 'E'xtracting files from Alt-F5/archives, etc.). Keeping in mind there are some bugs left, this is an interesting application to test and play with. However, for a serious usage |ZTreeWin is by far the preferred choice. Note, if you want to run CDCAT, you have to set your system date back to 1998, otherwise the program won't start. Appearance compares to XTGW 4.0, uses many of the latter's keystrokes, and supplies some tricky new features like a DOS command line redirecting the results to a separate Windows pane, and many more. Disk Haunting is indeed a fully-featured and powerful GUI Win95-XP filemanager, with an additional well-proofed XTreeGold keyboard interface. Unfortunately development has been ceased after the intial 1.0 release (respectively an bug-fixed 1.0c update), anyway it's worth a try ! Very interesting attempt in introducing an appearance which combines a close XTreeGold for DOS layout with a Windows User Interface; regrettably hasn't gone further than an alpha release with a number of bugs (above all accepting only upper case letters as commands), running somewhat unstable. Just for testing, not for everyday use. See }dk_scsh.gif for a screenshot. This is another surprising effort of creating a native text-mode clone for 32bit Windows systems. Appearance and user interface is formed very close to its model, too, and so this one also strongly resembles to Kim Henkel's |ZTree versions. And although the latter is still the one with the most intense development history, adding still more features than any other Win32 XTree clone, "eXtreme" anyhow is a very powerful filemanager and a remarkable contribution to the family of XTree clones. Meanwhile it includes pretty much of the functions XTreeGold has, while furthermore offering a number of additional, clever and independant new features. It evens runs under Linux using Wine, and thus for example opens files with the "Open"-command into the default native Linux application (e.g. LibreOffice etc.). Amazing!! Distribution policy, although nowhere explicitly mentioned, appears to be a freeware one, at least the program runs without any reminders to register. Simply a MUST-HAVE: FileMaster is the first and only really accurate XTreeGold clone for DOS systems ever!! Exactly the same screen, (nearly) all the same hotkeys and commands as XTreeGold plus some extra ones. Almost as close to its model as |ZTree for Windows 95-XP systems is. As most important advantage over the XTreeGold versions FileMaster is prepared to use Expanded Memory (EMS), so you won't get any annoying "Out of memory" messages when reading in large drives - logging to 100,000 file or more simultaneously is no problem for FileMaster (provided you have a sufficient amount of RAM available, of course). Not enough, the FileMaster distribution also includes a WordStar keystroke compatible text-editor (IB-Edit). Yet the installation program as well as all the info texts are available in German only (however, the program itself is supplied as both a German- and an English-language version). Post any comments or questions with running or installing FileMaster to the XTree Forum. Please note that FileMaster 3.1 has *nothing* to do with any other programs sharing the same name, such as the Win95-XP FTP client at www.filemaster.com ! See }specification text and }screen shot for more information. Also, refer to the respective XTFP Download section. 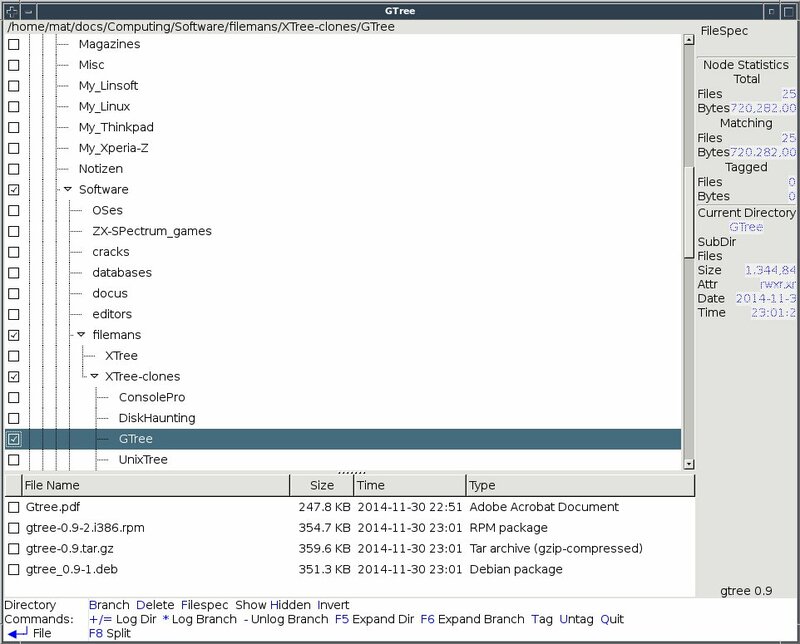 GTree is remarkable attempt to create a X-Window/GUI XTree-like filemanager for Linux, using the GTK+ library. It has a clean interface with many of the XTreeGold hotkeys available. Program development is in an early stage, a number of functions are still to be added and some bugs may occur (not recommended for regular use yet), but nevertheless a great project, which definitely would be worth to be continued. See the }"Readme"-PDF and a }screenshot. "linuXtree", or short "lxt", has evolved in course of time of it's interruptedly development history to a serious and powerful Linux filemanager with a strong XTree-cloning attitude. The interface may look somewhat peculiar compared to it's DOS models, in particular because of the omited command menu, but anyhow most of the familiar shortcut commands are there, along with some clever Unix/Linux-specific supplementary ones. After a long, long hiatus, development has been resumed and a new version has been released in 2008. 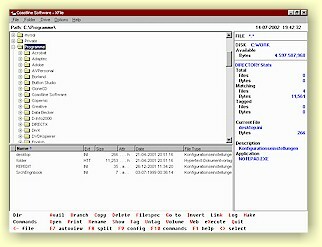 Introduced by Symantec as successor of XTreeGold for Windows 4.0, the Norton Navigator File Manager's user interface is remarkably similar to its predecessor when running in "XTreeGold mode"; most of the familiar hotkeys are there, along with the standard, alt and control menus at the bottom. And there is a bunch of new features and additional utilities added, for example you have direct FTP access within the file manager. Sales have been discontinued by Symantec in 1998. See }product information and }screenshot. A 30-day trial version is available for download. The Norton Navigator File Manager (|see above), with its XTreeGold for Windows-derived user interface has been re-used as file manager part in the 1996 "Norton NT Tools" suite, which additionally supplied a virus scanner, "system doctor" and some other system utilities. At least, this is the last official release of an XTree lineage file manager! See }product information and a }screenshot, read a >review by Windows & .NET Magazine and the original >press announcement by Symantec from 1996. "QuollEyeTree is a Cocoa File Management application for Mac OS X. QuollEyeTree is inspired by XTree (and its successor ZTreeWin for Windows), but rather than trying to duplicate either, aims to implement the essential functionality, while retaining the Mac look and feel, and honouring the Apple Human Interface Guidelines". UnixTree is the successor of the program that formerly has been known as "xtree for UNIX Systems". The author, Rob Juergens, has resumed development on the code (which is his own property) in 2000, and thus unexpectedly has granted the public *the* leading XTree clone for Linux and other Unix systems. Obviously UnixTree now is the most comprehensive and powerful adaptation of the unique XTree user interface to a great number of common Unix dialects, also including now a Mac OS X version. With its own X11 terminal emulation and ecurses library, UnixTree is the first XTree clone ever for Unix, which supports an XTree/DOS-style modifier keypress detection for ALT and "CTRL" (respectively SHIFT) commands and menus. Not enough, it's Free Software and Open Source since release 3.0.0 ! Currently UnixTree compiles under a wide range of Unix systems (including Linux and FreeBSD), as well as under Mac OS X and 32bit MS Windows systems. And due to its source availability there may soon be even more platforms, which UnixTree will be ported to! Also, refer to the xtree for UNIX Systems story at the XTFP "Stories"-section. After the young-died |DisKing this is the second attempt in a close graphical XTreeGold/DOS clone for Windows. Fortunately, unlike the former, XFile is a mature and serious piece of software, well suitable for everyday use. It's fun to experience how much XTree commands and hotkeys have been taken on and to play around with it's numerous new functions, especially for viewing text and graphics files. The keyboard interface and screen interaction feels almost as direct as its text-mode colleagues, and that's a big deal. See (a tiny...) screenshot. A promising new project of an XTree clone for Linux/Unix started on March 27th 1999, named "XTC". Although the beta releases are yet in development stage, they already provide most XTree commands on single and multiple (CTRL-keys) files. Moreover, the user interface offers a close "XTree-feeling", which other clones often lack. XTC once has appeared to become a powerful XTree clone, and a serious Linux/Unix file manager choice. Unfortunatly development has been discontinued in the meantime. The latest (last ?) version is also available at the respective XTFP Download section. "ytree" offers a fair (though basic) XTree emulation for Unix users; screen layout and command set is nearly the same as the DOS XTree releases, just slightly different due to Unix characteristics. Sheer number of functions compares to the early XTree versions, but furthermore providing archive logging facilities and some Unix-specific features like owner/group modifications and a pipe command. See also }ytreerev.txt for a detailed commentary on ytree 1.61 by 'BaDge' and a reply from the author. "ytree" can be compiled with >DJGPP for DOS/DJGPP and Win32 systems also, test an executable example from the Download section. Also, look at the >ZTreeBold beta releases page for the latest developments. See the complete and detailed }version history. Simply the best!! If any program should have the merit to be named "XTreeGold 5.0", then this one! Although a true 32bit application it runs completely in text mode and has exactly the same layout and user interface as XTreeGold 3.0 for DOS. Thus ZTreeWin brings the look and feel as well as the speed of use of the legendary XTree for DOS versions to modern 32bit operating systems, avoiding the DOS imposed limitations and, moreover, providing some cautious but utmost useful improvements. ZTree is able to handle long file and directory names, log to an unlimited number of disks and files, and allows the use of any current or future archiving program. All those, who loved good old XTree and use Win95-XP cannot live without that gem ! Final releases run quite stable and beta versions are under a continuous development. You will find them regularly updated at >www.ztree.com/html/beta.htm. Don't miss it! The project apparently hasn't gone further than a demo-release, the initial homepage is offline meanwhile, so I've decided to preserve it }here for review and download the demo. PowerDesk 4 is a multi-featured filemanager (a.k.a. "Explorer replacement") for Windows 95-XP, supplying an optional "XTree Gold keystroke emulation". This is the commercial version of the free "PowerDesk 5" program (|see above). It provides a bunch of >additional features compared to the free version. N.B. : "VCOM Products " meanwhile is at least the third (!) different company owning and releasing this product (after Ontrack and Mijenix (and maybe even still another one before ?)). QD3 is a hybrid between a Norton Commander and an XTree clone; the screen comes with a Norton-like two-pane appearance, letting you choose between file or directory listing or a tree view mode. On the other hand, most of the commands and hotkeys are derived from XTree. For example you can 'T'ag certain files, and then copy all of them with Ctrl-'C'opy. Despite some particular differences, QD3 has probably to be counted among the most considerable DOS applications emulating XTree keystrokes. No homepage (any more), see }qd3help.txt and }qd3.gif (screen shot) for more information. QD4 is a Win95-XP version of the DOS Norton/XTree hybrid clone |QD3. Once there has been a beta version for download, but meanwhile it has been withdrawn by the author. A final version never has been released, instead, a successing "QD5" version is currently under development (|see below). QD5 is the successor of |QD3 and |QD4, so it also combines the Norton Commander 2-pane desktop with an XTree-derived keyboard interface. The program ist still under major development and is rated by its author as "not [to be] use[d] on critical systems". But anyway this is an unique hybrid clone attempt and definitely worth testing. Provides a very similar to XTreePro user interface, with mostly the same commands and hotkeys, and just a few particular differences. ActaeOn is a very handy and fast utility, widely configurable, furthermore allowing user defined commands (as ALT-menus), a really clever highlight of this program. No homepage, see }act_read.txt and }act_scsh.gif (screen shot) for more information. Has to be counted as XTree clone, although not keystroke compatible, but using a very similar screen layout and command set; moreover hotkeys can be re-configured. CDP should not be used in Windows, it may work in Win95-XP with a properly configured pif-file, but it isn't able to read a VFAT hard disk. No homepage, see }cdp_read.txt and }cdp_scsh.gif (screen shot) for more information. Modeled after the XTreeProGold versions, using a number of their major commands and hotkeys and a similar screen layout, while furthermore providing some distinctive different characteristics. Unfortunately the starting of the Shareware version can be very annoying, because it nags the user with a reminder screen after every logged 400 files during drive reads! No homepage, see }dt_descr.txt and }dt_scrsh.gif (screen shot) for more information. Although mainly pull-down menu driven with very few hotkeys supplied, it uses a similar to XTree set of commands and operation conception. Provides a wide range of handy features, somewhat different to XTreeGold, but very powerful, too. Can be considered for serious usage on a DOS, Win 3.x or even a OS/2 environment (if it only would be throughout hotkey-driven...). Another very similar to XTree(Pro) user interface, with many matching commands and hotkeys and some particular differences. Can be considered to be among the more serious XTree surrogates on a DOS machine (but also suffers from the 640k memory barrier). No homepage, see }treetopr.txt and }treetops.gif (screen shot) for more information. 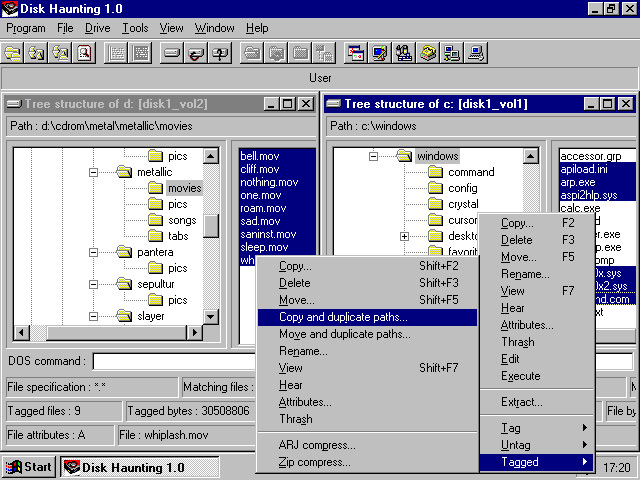 Another old DOS filemanager with a similar concept than XTree: A tree-like view of the directory structure (as the name suggests), and a separate file view mode, allowing the tagging, sorting and handling of files by certain criteria. On the other hand there are only a few hotkeys available, hardly anyone compatible to XTree, the complete command set is accessible only via pull-down menus. Treeview is not literally a close XTree clone, just an XTree-like, though still reasonable, filemanager for DOS systems. 'utree' is an early and interesting clone for Unix systems. Although the layout appears to be somewhat different to XTree at first glance, the concept is all the same, a tree-style display of the directory tree, a separated file-mode, file-tagging and obvious one-letter keystrokes presented on the screen. Some of them are common to XTree conventions, some of them are utree specific. Though a bit circumstantial with some commands, utree is nevertheless a clever tool for Unix environments, offering a number of easy-to-access functions rarely found in other file managers. This is the first and only (so far) Shareware clone of the XTree for Windows versions! The user interface is modeled closely to XTreeWin 2.0, and while some functions are still to be implemented, it furthermore supplies a number of handy new features, like a built-in animated-gif- and HTML-syntax-viewer, case-sensitive renaming, Win95-XP based file associations and many more. DTree is a treasure for all those used to the XTree for Windows versions, and a remarkable file manager for Win95-XP anyhow. Furthermore, since version 3.3, DTree is Freeware now ! See >screenshots of how it looks like. ===> Do you know of any other "real" XTree-clones not mentioned here? me. Thank you in advance! XTree and XTreeGold are registered trademarks of Symantec Inc.
Windows and Windows95 are registered trademarks of Microsoft Corporation. Other brands and products are trademarks of their respective holders.